Do you have a Sophia the First or any other Disney princess fan in the house? Here’s a simple craft you can do at home to make princess play time more fun. AND, wait for it, it costs less than 30 pesos! This craft was not one of our spur of the moment crafts. The little girl had this planned since yesterday when she saw the “gems” in a fabric shop in the local market. I was buying some extra clasps for her skirt when she asked if she could get some of the purple sew-on gems. She said that she absolutely needed them to make her crown and her necklace. She asked for two big oval gems and six small diamond ones. The gems and a meter-long of lace cost just 29 pesos in all. When we got home, I had chores to do and wasn’t able to help her gather materials for her crafts. What she did instead was “design” her Sophia the first crown and necklace. 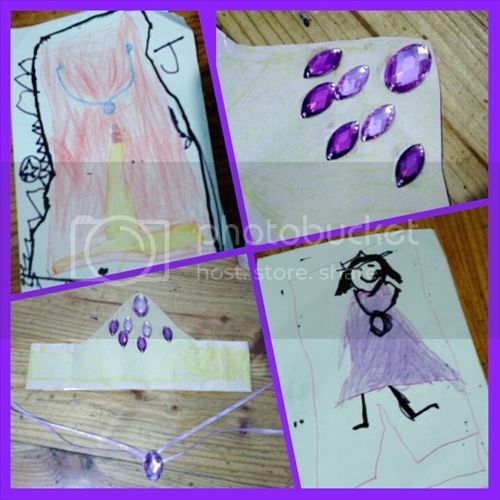 The collage below shows her sketch of the accessories and dress and her finished crown and necklace. Care to share how you’ve used simple items at home to make your kids’ playtime more fun? It’s been quite awhile since I’ve posted activities the kids do here at home. 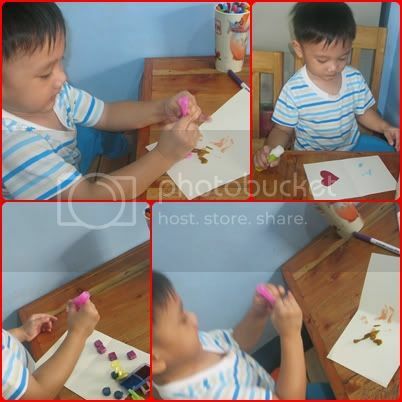 Since they started preschool last year, arts and craft time has been few and far in between. This week, we’re going to re-do a craft we did a couple of years back. What’s more fun is that we’re doing it with their classmates in school! For the kids’ birthday celebration this year, I coordinated with their teachers and prepared Li’l Einsteins themed activities for their school. I’ll tell you more about that and how I kept party expenses (food, theme cake, crafts, prizes and lootbags all included) below 7K in another post. For now, let me share with you what we did with a couple of plastic plates, a spoonful of beans, and some yarn. Since Little Einsteins aims to teach kids art and music appreciation, I decided to have the kids make their own shakers for our arts and crafts activities. 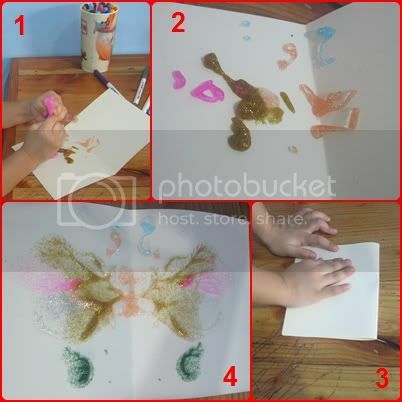 You can easily make these at home with your own little ones since the materials are most likely already available in your home. 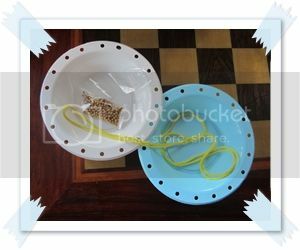 Recyclable plastic plates or bowls, at least a meter of yarn or any string, a tablespoon or two of uncooked beans (we used monggo) and a puncher for putting holes around the plates or bowls. The first thing you need to do is to punch hole around the plate or bowl. Try to make the spaces between the holes as equal as possible. The plates we used had a design on the rim which provided a good guide for me. 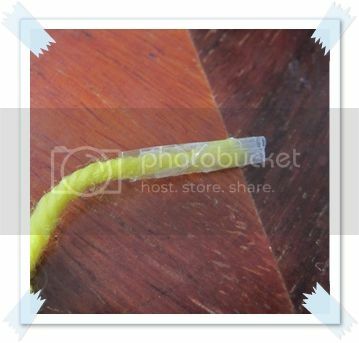 Next, place the monggo beans inside a tube plastic or a sheet of paper folded into a width of 1″. 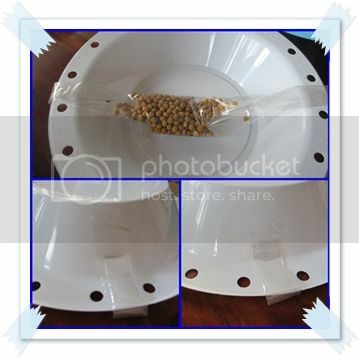 Tape both ends of the plastic or paper on the outer part of the plate. Of course, you can always just scoop the beans onto the plate but my kids are still preschoolers so doing this keeps all the beans secure while they weave the plates together. Then, put the two plates together and align the holes. 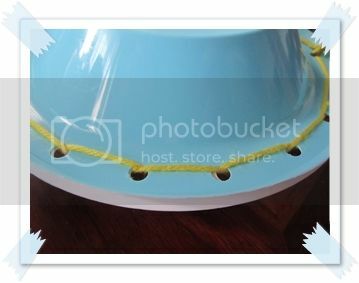 Weave the yarn through the holes securing the two plates together. I was pressed for time doing this sample so I opted to just weave straight through the holes. You can make your own pattern and weave diagonally or however way you want to. The important thing is to secure the two plates together so the beans would not fall out. Once you finish weaving the plates together, remove the tapes of the plastic that’s keeping the beans in place. Pull the plastic out from the closed end to scatter the beans inside. Ta-da! You now have a shaker to make fun music with! 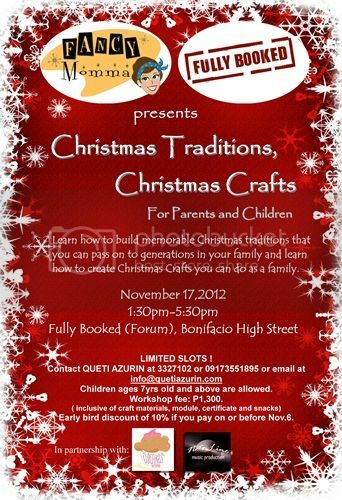 Fancy Momma is conducting a Christmas Traditions, Christmas Crafts workshop at Fully Booked High Street on November 17. Fancy Momma will be sharing some meaningful traditions that you can add to your existing family traditions. She’ll also be teaching eight Christmas crafts you can do at home. The workshop is open to parents and children so if you’re looking for a place to take your kids this weekend, you may want to take them to this workshop for some fun bonding over Christmas crafts. The little ones will be having a Halloween party in school this weekend. The teachers will be transforming the school into Neverland and the kids are to come as fairies or pirates. Fairy and pirate costumes are fairly popular during Halloween are always available in stores so it would have been a cinch to get the little ones some costumes. However, there were specific instructions not to buy ready-made costumes. We are to use our creativity and resourcefulness in making our kids costumes. We are encouraged to mix and match existing clothes or to make the costumes ourselves. I’m not really handy with the needle so sewing their costumes was out of the question. 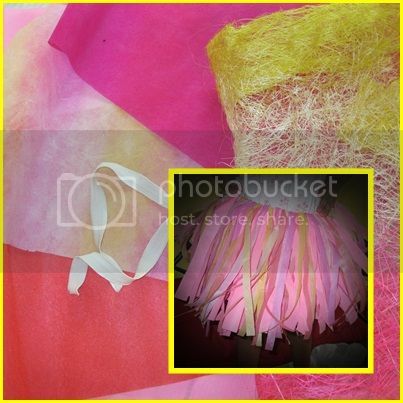 Thankfully, I was able to find a no-sew guide on how to make a fairy or ballerina tutu using just a piece of garter and some tulle. 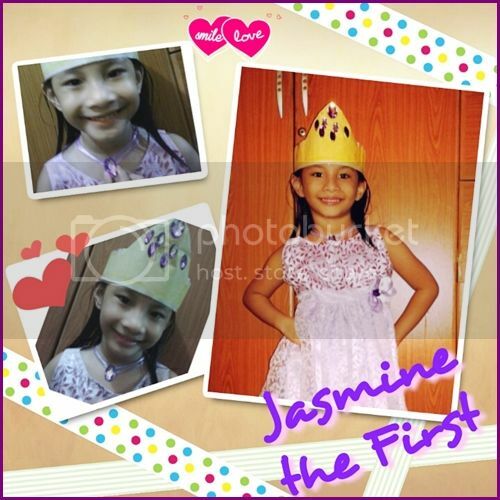 It was so easy to make that I was able to make one for my little Jade last Saturday night. I didn’t even need to buy any materials to make it. My Mom has a stash of paper tissues from bouquets she had received through the years which I thought would be a perfect substitute for tulle. The garter was scavenged from an old raggedy pair of shorts. Want to make this for your little one as well? Here’s how I made my little girl’s tutu. Measure your child’s waistline. Cut the garter about two inches shorter than this and sew ends together. Fold paper tissue crosswise and cut into ¾-inch strips. Knot the strips, alternating colors, around the garter until you have a full tutu. There, just three easy steps. How simple can that be?! This can even actually be done by grade schoolers who are already adept at using the scissors and doing simple knots. I finished my girl’s tutu in just one afternoon. Without any interruptions, you can actually finish a tutu in just an hour. The tradition of hand crafting greeting cards has been passed on from generation to generation in our family. My little ones may not be old enough to create complex art creations but they are sure old enough to make simple cards for special ocassions. I didn’t have time to prepare materials for Valentine’s crafts this year so we had to make do with board paper in white and red, stickers, and glitter glue. 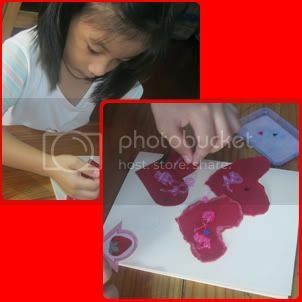 Upon being given the materials, Jade immediately busied herself pasting hearts and decorating her Valentine’s cards. Little Jakei made a mess with the glitter glue. However, this “mess” became a beautiful artwork that we ended up making more glittery butterflies. These cards may be crude and simple but they are by far the most precious Valentine’s cards for they were made with love. Want to check out what we did for Valentine’s Day last year? Click here.